In the fourth week of June alone, five members of the Groundwater Protection and Waste Disposal department in Switzerland presented their expertise at international conferences on radioactive waste disposal. Department head Thomas Kämpfer is an invited speaker at the Endlager-Symposium 2014 – Standortauswahlverfahren in Düsseldorf, Germany, a symposium touching on the many aspects of site selection processes for a repository. His talk is on optimization potentials in the siting process, based on the regulatory framework of the Swiss Sectoral Plan for Deep Geological Repositories and experience gained since its coming into effect in 2008. 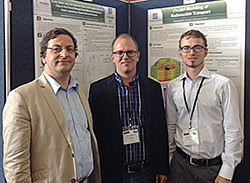 For the IGD-TP GEODISPOSAL 2014 conference in Manchester, UK, we have been given the opportunity to make four contributions. Our youngest participating team member is master student Lorenz Ammann who was granted an EU scholarship to present his outstanding project work on parallel modelling of radionuclide transport which he performed during his internship with us. The contribution presented by Jean Croisé focuses on the challenging hydrogeological characterization of clay-rich hostrock. Olivier Masset gives a talk on the simulation of radionuclide transport in the context of the long-term safety analysis for the German repository Morsleben (ERAM). Gerhard Mayer has developed a software tool to aid numerical modelers, repository implementers and regulatory authorities in the quality assurance of the numerous simulation results of a safety analysis. Participants were able to test the software themselves right there and then.